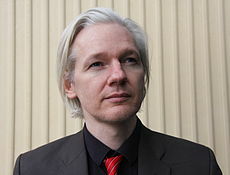 ↑ "Julian Assange's mother recalls Magnetic". Australia: Magnetic Times. 7 August 2010. ↑ ASSANGE, JULIAN PAUL 30 November 2010. Interpol. ↑ Johns-Wickberg, Nick (17 September 2010). "Daniel Assange: I never thought WikiLeaks would succeed". Crikey. ↑ "Julian Assange". Centre for investigative journalism. สืบค้นเมื่อ 3 December 2010. ↑ "Amnesty announces Media Awards 2009 winners". Amnesty International. 2 June 2009. Archived from the original on 30 May 2012. สืบค้นเมื่อ 3 December 2010. ↑ Alex Massie (2 November 2010). "Yes, Julian Assange Is A Journalist". The Spectator. สืบค้นเมื่อ 3 December 2010. ↑ Harrell, Eben (27 July 2010). "Defending the Leaks: Q&A with WikiLeaks' Julian Assange". TIME. สืบค้นเมื่อ 1 December 2010. ↑ "Wikileaks founder Julian Assange arrested in London". BBC. 7 December 2010. สืบค้นเมื่อ 2010-12-07. หน้านี้แก้ไขล่าสุดเมื่อวันที่ 17 ธันวาคม 2556 เวลา 23:36 น.